Adults and children alike will love exploring the blend of nature, history and community at Possum Creek. Hike together in one of Ohio’s best examples of a tall grass prairie. It’s hard to imagine that this home for butterflies and bluebirds was once degraded farmland. Argonne Lake’s open vistas of woodlands and wildlife provide the perfect setting for fishing for catfish, bass or trout. Youngsters will love visiting the farm to see the barnyard animals and learn about the food we eat. Camp overnight or picnic with family and friends. Discover remnants of the past along the Argonne Forest Trail. Come back often to enjoy the seasonal changes and make outdoor memories that will last a lifetime. Dogs are welcome, but, for the safety and comfort of all patrons, they must be leashed and under control at all times. Pets are not permitted on the farm. School field trip tours are available by request. Call to schedule. Learn more about available field trips. Possum Creek MetroPark Edible Farm is striving to become a leader in promoting small-scale food raising for the local community. From chickens to rabbits, honey to herbs, there’s so much more you can do with your yard than just grow fruits and veggies. Learn how at the farm. Argonne Lake is a great location for the family day out. Visit the farm animals and then spend some time fishing at the lake or ponds across the park road, free-of-charge and without a license. Argonne Lake has reservable shelters and camping. The Education Center at Possum Creek MetroPark is home to public educational programs year-round. These programs focus mainly on local food and the environment. The history of some of the MetroParks includes a lesson in land use prior to urban sprawl and the imperative to conserve natural space. You can still see traces of the former Argonne Forest amusement park at Possum Creek MetroPark. Hike the purple trail loop, which begins at the trail head at the Argonne Forest parking lot. Bring a picnic lunch to enjoy at the nearby shelters or picnic tables for an afternoon of “natural” amusement! This planted prairie is named in honor of Jean V. Woodhull for her outstanding contributions to Five Rivers MetroParks. In 1962, she was instrumental in the creation of MetroParks. The prairie is an important part of Ohio’s native landscape that MetroParks actively manages to preserve. It is composed of plants that are seldom found in other habitats, including wildflowers such as coneflower, dense blazingstar, sawtooth sunflower, prairie dock and spiderwort. Prairies like the one at Possum Creek provide rare native habitat for birds, butterflies, insects, reptiles and other small wildlife yet require little maintenance and are long lasting. All parking lots have accessible parking. The reservable shelters are accessible. The farm and barn are accessible as are the restrooms at the farm, reservable area, pond lot and the Argonne picnic area. The first fishing pond is connected to the pond parking lot by a handicapped accessible asphalt path. Drinking fountains are available at the farm, Argonne Lake, the fishing ponds, reservable shelters and the Argonne trailhead. All drinking fountains are ADA accessible except for at Argonne Lake. There is interpretative signage at sites throughout the Argonne Forest explaining features of the former amusement park. Flush restrooms are available at the reservable shelter area and at the farm. Vault toilets are available at the fishing ponds, Argonne Lake and Argonne Campsite parking lots. Portable toilets are available at the horse trailer lot, the fishing ponds and seasonally at the community garden parking lot. With five easily accessible campsites and built-in amenities such as fishing ponds, hiking trails, the historic Argonne Forest, sustainable farm and more, Possum Creek MetroPark is an excellent place to take your next camping trip with family, scout troop or first-time camper. Picnic table, pit toilets and firewood are provided. Water available nearby. Permit required. Possum Creek MetroPark consists largely of former farmland that is going through the process of natural succession. More than 100 acres of degraded farmland and dumps have been cleared and planted into native Ohio prairie since MetroParks established the area as a park in the 1960s. Possum Creek’s prairie areas were planted starting in 1980 to serve as a haven for the now-rare plants and animals that once inhabited natural prairie openings in southwestern Ohio’s woodlands. The prairie took years to establish, but it now thrives on the poor ground. It is currently one of the largest and most diverse planted prairies in Ohio. These open areas consist of grasses that reach heights of 6-10 feet by late summer and are filled with a variety of wildflowers (forbs) that add color to the sea of grass. Prairie wildflowers reach their blooming peak in mid-summer and early fall. Bluebird boxes are scattered throughout the Jean Woodhull Prairie. These boxes provide nesting opportunities for the cavity nesters who have been in decline due to declining habitat and competition for nest sites from house sparrows and European starlings. Volunteers monitor the boxes and clean them for up to three groups of fledglings each year. Although the land that is now Possum Creek MetroPark has been dramatically changed by past land use, it stands today as a splendid example of what can be achieved with proper stewardship and restoration, and is a delightful place for the naturalist, hiker or family. Fishing is available at the following locations without a state fishing license. Argonne Lake: Three bass per day/ must be longer than 14 inches. There is a 14-inch minimum size on bass and a limit of three fish per day. Fishing Ponds: The ponds are stocked with catfish in summer and trout during the winter. There is a five fish limit for catfish and trout; all other fish are catch-and-release. All fish must be released from the northernmost pond (pond number 4). Small nonreservable shelters around the ponds are also available. Nonmotorized boats are permitted on Argonne Lake. Ice fishing is permitted, but ice conditions are not monitored. Night fishing is available until 2 AM from Memorial Day weekend through Labor Day at the fishing ponds only. Significant natural features of Possum Creek include bottomland hardwood forests along Possum Creek, two mature beech woodlots and numerous created ponds and wetlands. More than 100 acres of degraded farmland and dumps have been cleared and planted into native Ohio prairie. These tall grass prairies, Argonne Lake and ponds provide habitat for a variety of birds, including bluebirds, goldfinches, hawks, ring-neck ducks, blue wing teal, pied-billed grebes and American coots. Discover Ohio’s amazing construction workers — beavers! These animals are making a comeback in our state, thanks to conservation efforts. You can see beaver activity at the park. They are abundant in the fishing ponds and Argonne Lake. Look for their dome stick lodges at the edges of the ponds and the lake. Beavers are most active in the morning and evening. Hike the orange trail or the path that connects them and look for dams, a lodge and gnawed trees. Deer are also abundant in the prairie areas. Coyotes have made themselves at home in the park, as well. These predators play an important role in helping to control populations of other mammals, which keeps forests and other habitats at sustainable levels. See if you can spot coyote evidence along the orange trail at Possum Creek MetroPark. There are several trailheads where you can start exploring. The small ponds and lakes of Possum Creek are not only great places to fish but important habitat for many creatures. During your visit look for the great blue heron (Ardea herodias) that flies in to feast on fish and insects. Or listen for the green frog (Lithobates clamitans melanota), an amphibian that is 2-3 inches long and sounds like the plucking of a bass string on a banjo. See our recent bird surveys for bird species that inhabit the park. The Possum Creek MetroPark Food Farm is striving to become a leader in promoting small-scale food raising for the local community. From chickens to rabbits, honey to herbs, there’s so much more you can do with your yard than just grow fruits and veggies. Learn how at the farm by walking through our demonstration areas or signing up for an educational program. Large garden plots are available to rent on an annual basis at Possum Creek. There are 90 plots available for growing produce to feed you and your family from April through November each year. Learn more about garden plots. Enjoy 5.5 miles of scenic, mostly level trails. 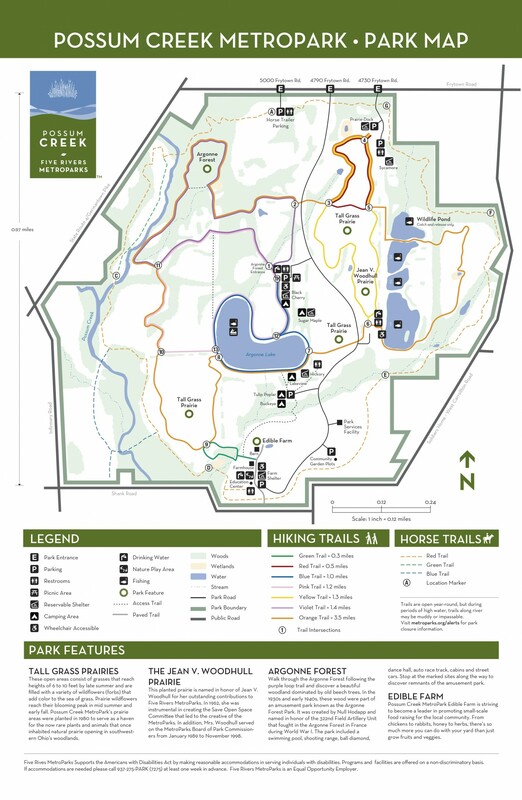 Trails are color-coded and trail intersections are marked with a number corresponding to the numbers on the trail map. The park’s longest trail, the orange trail is a 3.5-mile loop covering most of the grounds, including two prairies, the ponds and the Argonne Forest. Hike through this wooded trail to discover remnants of a 1930s amusement park dedicated to a World War I military unit. A low L-shaped wall, once part of the swimming pool, can still be seen; and remains of three street cars are hidden on the forest floor. A large cement square, which may have been part of the dance floor, also remains. Most of the figure-eight auto track is now under a lake built by the Park District in 1979, but a hiking trail still follows portions of the old track. The building that was once the veterans’ clubhouse still stands on the southeast corner of Germantown Pike and Frytown Road. Behind it, some of the buildings that were part of the carnival midway remain. Possum Creek is one of Five Rivers MetroParks’ earliest parks. Its scenic land was outlined in the Montgomery-Greene County Open Space Study Report of 1959 as a stream-side park that would serve Dayton’s southwestern metropolitan area. The more than 4-mile bridle trail at Possum Creek is relatively flat, scenic and has very few obstacles, which makes it perfect for beginners. Its close proximity to the City of Dayton allows riders to feel like they can get away without having to the long drive. The trail loops the park, taking riders past the farm and community gardens. Horse trailers can be parked and unloaded at the horse trailer lot at 5000 Frytown Road. Water, picnic tables, grills and restrooms are available at the trailer lot. Significant natural features at Possum Creek include bottomland hardwood forests along Possum Creek, two mature beech woodlots and numerous created ponds and wetlands. The park also has one of the largest and most diverse planted prairies in Ohio. Possum Creek has a Nature Play Area with logs, rocks and stumps next to the farm house. Families can also explore the stream accessible off the green trail, which is a one-third mile loop trail. During farm hours you can stop in and visit with the farm animals and learn how you can grow and raise your family’s food. Enter from Frytown Road — 4790 is the middle entrance — and drive until the road ends in the last parking lot. Paddling is allowed at Argonne Lake. A composting demonstration area can be found near the Food Farm. The facility does composting on site and offers visitors a chance to see how it works. To get started composting on your own, take our three Compost Kitchen programs offered quarterly. Participants learn about soil science, practical aspects of making compost and how to use it to create a sustainable growing system. Choosing the right landscaping for your climate will lower maintenance costs, cut your heating and cooling bill, protect your home from cold wind and hot sun, lower noise and air pollution and reduce your water use. Low water use gardens can be viewed at Possum Creek near the farm. Take some ideas home with you! If you enjoy the outdoors, farm animals and gardening, Possum Creek MetroPark is the place for you. Special programs, events and learning experiences are made possible through volunteer participation. In addition, volunteers plant and maintain the farm’s flower beds and assist with the community gardens. Training sessions are offered throughout the year to increase your skills and knowledge. The park has more than 5 miles of wooded trails for winter walking, hiking and cross-country skiing. Cross-country ski the picnic areas and open meadows. Most hiking trails are not suitable for skiing due to steep terrain. Hiking trails are open all winter long in most MetroParks, including Possum Creek. Birding is a great way to learn about nature and get outside in your parks. From the young to the young at heart, people of all ages can enjoy this activity year-round. Winter in Ohio offers many opportunities to explore the woods for songbirds. Ice fishing is permitted, but ice conditions are not monitored. Fish, free-of-charge and without a license, in ponds and Argonne Lake. There is a 10-inch minimum size on bass and a six-fish limit per day. Trout is introduced to the ponds during cold months (typically December through February or March). This 580-acre park is the perfect place for a family outing.